Oral sessions are over for the first day of the Division for Planetary Sciences meeting here in Denver; the poster session is getting underway. I'm taking a brief mental health break away from conversation and the press of people to try to get some of my notes on today's sessions onto the blog so I don't build up too much of a backlog! Today there were talks on asteroids, the Moon, Mercury, and historical astronomy. In the morning I focused mostly on Mercury. Benoit Noyelles showed the results of some modeling work he has done to explain how and when Mercury reached its funny spin-orbit resonance. Remember, Mercury performs 2/3 of a rotation for each orbit of the Sun -- a 3:2 spin-orbit resonance. Through numerical simulations that took three months on a 60-core processor, Noyelles found that the 3:2 resonance was the most likely one for Mercury to be captured into; he also found that it happened quite soon after Mercury's formation, in the first 10 or so million years of its existence. That's interesting in the context of Simone Marchi's talk. 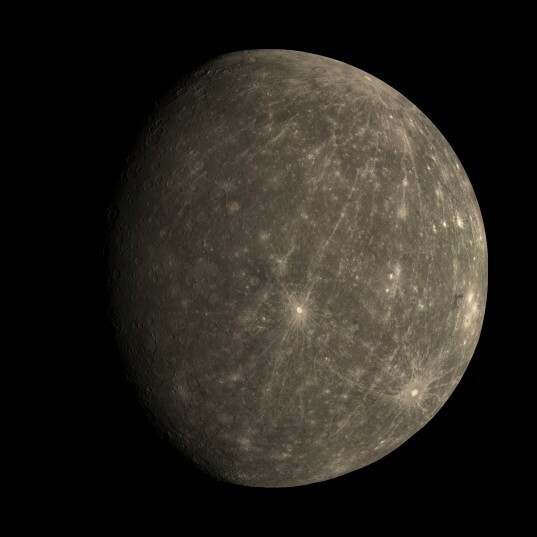 Marchi used new MESSENGER global maps of Mercury to find the very oldest terrain on the planet. In a global 500 meter-per-pixel mosaic of Mercury, they mapped all craters larger than 25 kilometers in diameter. A map color coded by crater density shows a large region east of the Caloris basin that contains the oldest terrain on Mercury. Comparing it to the Moon, the density of craters in this region is between that of Nectarian and pre-Nectarian terrain on the Moon (check my recent blog post on lunar chronology to understand what that means). But Mercury is not the Moon -- it's in a different place in the solar system, closer to the Sun, and it's more massive, so it has higher gravity. Marchi says that as a result of these differences, there should be three times more craters per unit surface on Mercury than on the Moon for terrain of similar age. He said you wind up with an age for this oldest terrain on Mercury of 4 to 4.1 billion years old. For the much younger northern smooth plains -- the huge area of lava flows that cover Mercury's north polar regions -- he got an age of 3.5 to 3.8 billion years. He concluded that Mercury experienced a major resurfacing event, possibly more than one, that has wiped out the entire first 500 million years of Mercury's geologic history, and then speculated that this could've been tied to the Late Heavy Bombardment. A questioner stood up and said his relative age dating was fine but that those numerical dates were highly uncertain. Marchi disagreed. You've read my post on absolute age dates, I'm sure; you know what I think! Jim Richardson then looked at Mercury's populations of secondary craters. These are craters that form when you get a big impact that tosses out big blocks and those big blocks make their own craters when they land. On Mercury, there are more secondary craters than on the Moon for equivalent-size impacts, and the craters are packed closer to the primary crater. Richardson showed that this can be accounted for entirely by Mercury's increased gravity and higher impact speeds (because it's closer to the Sun, objects in heliocentric orbits that intersect Mercury are moving at an average of 42 kilometers per second, compared to only 20 at the Moon). You don't need the Moon's materials to be substantially different physically from Mercury's to account for the changes. Larry Nittler showed the results of ongoing work to map Mercury's global surface composition. The coolest thing from his talk was the discovery of a particular region on Mercury that's unusually higher and also more variable in magnesium content than the rest of the planet. It also has more sulfur and calcium but less aluminum. It also has relatively thin crust. And it also has a high density of those weird hollows on Mercury's surface. And it also happens to correspond to the area that Marchi was talking about, the oldest visible terrain on the surface of Mercury. He didn't have much to say about why this region is different from the rest of the planet, but it's quite different and definitely a site for future study.